I know Microsoft is from America, that’s fair enough, and they have built into Windows the ability to change the ‘locale’ and language. But its really annoying when you install Office and it just assumes you want an American dictionary. Now something like 80% of my visitors are American and they will probably be surprised that us limeys spell things differently, after all we all speak English right – well yes we do, but written (British) English is different to written (American) English. e.g. Centre, Colour, Theatre, Analyse, Catalogue, and Programme, etc. Which is OK, you’ve had a few hundred years to do you own thing, and English is derived from Anglo-Saxon/German, Latin, French, Greek and a great deal of other languages anyway. 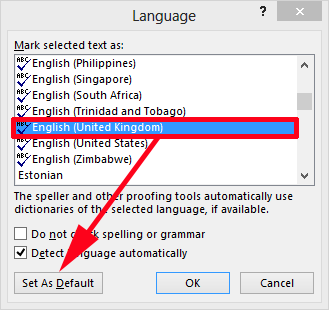 So when I go into Office Settings and SPECIFICALLY TELL IT I want my default language to be English (United Kingdom). Why would I want it to set the dictionary to English (US)? I’m assuming you have already gore to File > Options > Language > And set the correct language settings. 1. Review > Language > Set Proofing Language. 2. Select your desired language > Set as Default.